Chronic pain is often associated with physical or emotional trauma that may have happened years before and is seemingly unconnected to the present condition. At one hospital-based pain clinic, researchers found up to 47% of patients had experienced abuse in the past. Some scientists have suggested that chronic pain is a physical expression of Post Traumatic Stress Disorder. Patients may experience pain instead of flashbacks or nightmares. I have personally witnessed instantaneous recovery from angina, disc pain, and electric shock-like pain from a man who fell 12 feet off a ladder and landed on his head 8 years earlier. There is no end to the benefit of chronic pain patients. Another approach involves the body subtle energy network, or thought field therapy using acupuncture meridians. Psychologist Roger Callahan discovered more than 30 years ago that acupuncture points could be stimulated to relieve the anxiety associated with frightening situations. In theory, stimulating acupuncture meridians while re-experiencing a traumatic event flushes blocked energy out of the body. After treatment, patients are often able to review the memory without anxiety. According to holistic medicine, “Whatever you don’t express, you repress, until it expresses itself as disease or dysfunction.” Now that emotions have been shown to be chemicals in our bloodstream, it can be theorized that harmful emotions are actually harmful chemicals, which can cause disease. Whatever organ is the origin of the emotional chemical, that is the organ that will eventually manifest as disease. Through the use of Neuro Emotional Technique (N.E.T. ), these negative thought patterns can be erased and the diseased organ, restored to health. All of our emotions can be divided into two categories: Love and Fear. Anything that is negative, restrictive or limiting is fear-based. That which is positive, compassionate, and supportive is love-based. Often times, we find ourselves stuck in certain emotional patterns. Changing the old thought pattern requires changing the words or direction we give our subconscious. This is known as the way out. Whatever negative emotions we hold, can be released by changing your thought patterns, and clearing the cellular memory using NET. What holds people back is the fear of the unknown and a certain comfort level with what is known, even if it is painful. Emotions have been found to be encoded within the DNA of the cells and passed on from generation to generation. Behavior patterns have even been found to be locked within families. Transplant recipients report strange memories and desires which further substantiates that emotions are stored in the body and encoded in the DNA of the cells. More recently, studies at New York University proved the amygdala (gland of the brain that stores and releases trauma in the body) did not respond to sound or sight or touch, but ONLY releases emotional trauma through the sense of smell. The body never lies, and stores what hasn’t been resolved. Emotions themselves are stored in the body in its organs, glands, and systems. They are projected and received via the energy transmitted through the chakras. Once emotions are generated or accepted into our energy field, they move through the body via the meridian system which consists of energy channels that feed all the glands, organs and systems. Emotions, like areas of the body, have specific vibrational frequencies and will accumulate in areas with the same frequency. 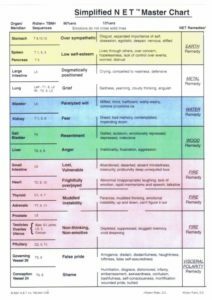 This is why certain emotions are associated with certain areas of the body, and how the chakras are connected o the meridian system. Sometimes we bury our emotions and they are stored in the body until the pressure builds, producing pain or disease in the area. Sesquiterpenes, found in high levels in essential oils, help increase the oxygen in the limbic system of the brain which unlocks the DNA and allows emotional baggage to be released. We discussed N.E.T. earlier and how emotional patterns get stuck in our bodies. Many theorize that our thoughts and actions, both past and present, can be influenced by essential oils. They are placed on very specific locations on the body to influence and heal the related organ. For example, the Cancer point is located Lateral to the atlas, just under the skull. The emotion behind cancer is Self-Denial, and its oil is Forgiveness. The other side of self denial, is wisdom. The way out is I support Myself. So to influence cancer, place the oil on the alarm point, along with the emotional points and repeat I support Myself. This should be done 3, 7, 10, or 18 times per day for 1, 3, or 7 weeks. Many people (myself included) believe that one cause of cancer is the relentless pummeling of neuropeptides inside our bodies, that are released when our subconscious is triggered by daily events that reminds our body of something unresolved from the past. Aromatherapy means to treat with aroma through inhalation. Aromatherapy also encompasses the topical application of essential oils. Because essential oils have a unique lipid-soluble structure, they are able to easily pass through cell membranes, particularly of the skin, and diffuse into the bloodstream. They penetrate the skin in the same way that the active ingredients in transdermal hormone patches or nicotine patches do. Essential oils are found in the circulating vascular fluids of plants. These vascular fluids containing the essential oils perform many of the same functions in the plants body as blood does in ours. Essential oils were used for over 6000 years by prophets, kings, priests, emperors, and pharaohs from different cultures and times to promote youthfulness, beauty, and protection from disease and plague. The science of aromatherapy and essential oils is as old as the beginning of time but is one that has been lost through the ages, and only in the last 100 years it is making its reentry into the modern world. Essential oils are known for their antiviral, antibacterial, anti-fungal, and immune-stimulating properties. The term aromatherapy was coined in 1920 by Rene-Maurice Gattefosse, Ph.D., a French chemist. A laboratory accident caused a third degree thermal burn of his hand and forearm. He plunged his arm into a vat of lavender oil, thinking it was water. To his surprise, the burning ceased within a few moments. With the regular application of lavender oil, the wound healed without a scar. Dr. Gattefosse shared his studies with a colleague, Jean Valnet, a medical doctor in Paris. Exhausting his supply of antibiotics as a physician in China during WWII, Dr. Valnet began using therapeutic-grade essential oils. To his amazement, they had a powerful effect in reducing and even stopping infection. He was able to save many soldiers who might otherwise have died, even with antibiotics. Oils have the ability to bring oxygen to the body at a rate of 21%. Disease cannot live in the presence of oxygen. Oxygen is the key – bringing oxygen to the body creates a reduction in the pain and the beginning of regeneration. As the essential oils get the oxygen into all areas of the body, they assist in getting the blood flowing. They also create a frequency and energy which affects the brain and the body. Oils also increase ozone and negative ions, which inhibit bacterial growth. European scientists have found that essential oils work as natural chelators, bonding to metallics and chemicals and ferrying them out of the body. No two oils are alike. Some constituents, such as aldehydes, found in lavender and chamomile, are antimicrobial and calming. Eugenol, found in cinnamon and clove, is antisepticic and stimulating. Ketones, found in lavender, hyssop and patchouly, stimulate cell regeneration and liquefy mucus. Phenols, found in oregano and thyme oil, are highly antimicrobial. Sesquiterpenes, predominant in frankincense and sandalwood, are soothing to inflamed tissue. They were found in 1994 to go beyond the blood brain barrier, increasing oxygen around the pineal and pituitary glands. Research has shown that each essential oil contains a certain bioelectric frequency that when inhaled travels to the secondary neurons in the olfactory bulb, which sends impulses to the limbic system and the olfactory sensory center at the base of the brain. They then pass between the pituitary and pineal gland and move to the amygdala, which is the memory center for fear and trauma. The impulses then travel to the gustatory center where the sensation of taste is perceived. Only in 1989 was it discovered that the amygdala plays a major role in storing and releasing emotional trauma and that only odor has a profound effect in triggering a response from this gland. The brain sends signals to the neurotransmitter and to the glands and organs, having an effect within seconds on emotions, hunger, thirst, sleep, mood, sexual response, health and immunity. In Europe, research has found that essential oils enhance individual cell immunity and is one of the greatest supports to the immune system found. Frequency is defined as a measurable rate of electrical energy flow that is constant between any two points. Everything has an electrical frequency, including essential oils. Royal Raymond Rife, M.D., developed a frequency generator in the early 1920’s. He found that with certain frequencies he could destroy a cancer cell or a virus. He found that certain frequencies could prevent the development of disease, and others would destroy disease. Nikola Tesla said that if you could eliminate certain outside frequencies that interfered in our bodies, we would have greater disease resistance. Bjorn Nordenstrom, a radiologist from Stockholm, Sweden, discovered in the early 1980’s that by putting an electrode inside a tumor and running a milliamp D.C. current through the electrode, he could dissolve the cancer tumor and stop its growth. He found electropositive and electronegative energy fields in the human body. Essential oils contain their own electrical frequencies and can be used as a more natural way to increase the body’s electrical frequency. Measuring in Hertz, it was found that processed/canned food had a zero Hz frequency, fresh produce had up to 15Hz, dry herbs from 12-22 Hz and fresh herbs from 20-27 Hz. Essential oils started at 52 Hz and went as high as 320 Hz, which is the frequency of rose oil. A healthy body, from head to foot, typically has a frequency ranging from 62-78 Hz, while disease begins at 58 Hz. Clinical research shows that essential oils have the highest frequency of any natural substance known to man, creating an environment in which microbes cannot live.